KATHARINE Walker may have suffered "a good shock to the system" but she has now readjusted her crown and hit the ground running in her new role as Miss Northern Ireland. The dedicated paediatric nurse at the Royal Victoria Hospital for Sick Children is determined to use her time as the 2018 winner to prove that the competition, which has now been running for 32 years under the direction of model agency boss, Alison Clarke, is more than a superficial beauty pageant and much more than an opportunity to "get great pictures". While her head may still be a little in the clouds only a few weeks on from lifting the title from last year's winner, Anna Henry, the Hillsborough girl (who took home a prize package including Fiat car and modelling contract with Belfast-based ACA models) is determined to keeping her feet firmly planted on the ground – or, rather, the clinical floors of her usual beat in and around the wards at the children's hospital. 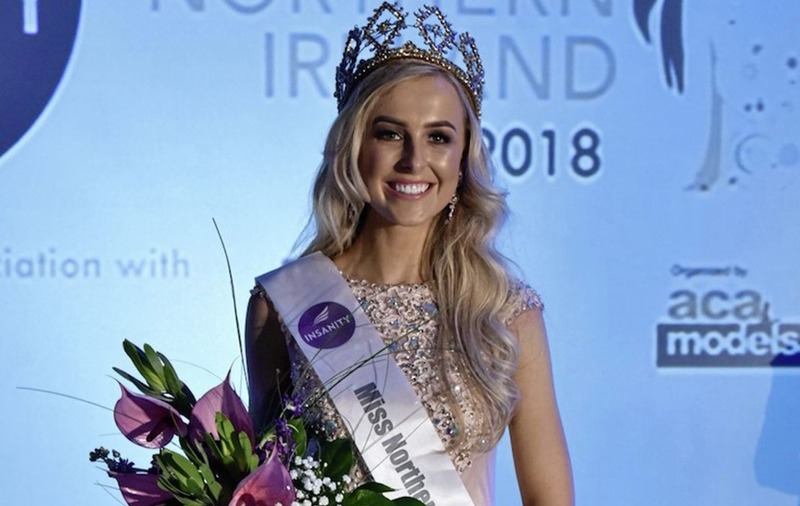 "I want to show that Miss NI is so much more than just getting your picture taken and that it is a beauty contest with purpose," states the 23-year-old who was named the new Insanity Tan Miss Northern Ireland at a glittering ceremony at Belfast's Europa Hotel last month. "Everything has gone a little crazy since and I've had to get used to photo shoots and being booked for different engagements and it's all really exciting... but when you work with very sick children you tend to keep perspective. "The work can make you very emotional at times and I often will go and have a little private cry in the tea room, but then you wipe away your tears and go back and do your next shift, always being positive and doing your best for the children in your care – and their families." It is a job she has loved ever since graduating in nursing from Queen's University in 2016 and, despite the inevitable heartache, there are highly rewarding moments too. "When children reach a stage where they are getting better and ready to go home, it is such a joyful time for me and my nursing colleagues," Katharine says. "Children are very resilient and often survive against all the odds. "Recently, a little one-year-old girl with complex needs had been desperately ill after being admitted in February and when she was ready to go back to a ward in a district general hospital, it felt like she was on the right path and that we had helped a little with her journey. "Parents say they can never thank you enough, but even though we are doing what we are trained to do, it is a great feeling. Those moments are very special and are, I think, the reason why I do this job." She is hoping the new Miss Northern Ireland role will become an extension of her 'everyday' job of helping others, especially since ACA Models has enjoyed an ambassadorial partnership with the Northern Ireland hospice for several years. Katharine, whose name has now been added to the hospice's celebrity ambassador programme – headed by Eamonn Holmes – is thrilled that she will be able to help support the charity which offers specialist respite, symptom management and end-of-life palliative care to over 3,500 infants, children and adults each year. "One of my first duties was attending a children's hospice dinner and I think the Miss Northern Ireland contest is an important platform to raise awareness and support fantastic organisations like this," she says. "I look upon it as having two 'helping' roles this year – I am doing the same thing, but just in two different ways." She is quick to defend such competitions in an age of modern feminism and equality and believes the contest has kept pace with the times, kept itself updated and is still "relevant" in 2018. "Some people think negatively of beauty competitions, but at the end of the day, they are still here and girls – smart girls from all different backgrounds – are still entering them," she adds. "It is a choice and it's as popular as ever, so that says it all, really. "Working with the hospice is an example of how you can use the role to bring real benefit. It's not all glamour and I want to show that element throughout my year. I have always worked hard, whether in my job or in my sports and I will work hard in this role too." Her sports are tennis and hockey, with the latter responsible for two lost teeth when she was hit by a hockey ball aged 16. The accident knocked her confidence for a while, but didn't deter her from playing the sport again, both at school and later at university. "I always loved my sport, but I really wanted to be a weather girl," she reflects. "Geography was my favourite subject at school and I am still interested in it. I also wrote a lot of poems, so for the talent section of Miss Northern Ireland, I made up a poem about the competition itself. "I made it up while on night duty and although it was about the competition being more than a beauty pageant, it was still light-hearted and fun. "I look at television presenters like Zoe Salmon, a former Miss Northern Ireland, and I think it would be great to try my hand at being a presenter if the opportunity arose. But, my heart will always be in nursing and I would love at some stage to open my own day care centre for children with special needs." Mum Wendy, dad Fred and older brother Gareth are naturally delighted with her success – and happy it brought the unexpected bonus of keeping Katharine in Northern Ireland for a while longer. "I intended to travel to Australia in January to gain more experience in clinical skills, working with children with special needs in Melbourne, but that has now had to be postponed," she says. "But I'll still be travelling as the winner of Miss Northern Ireland gains automatic entry to Miss World which is being held in China in November. "I'm not sure what all will be involved over the course of the next year, but I know it will be its own adventure. I'll be an ambassador for Northern Ireland, meeting lots of people and chatting to them. "Luckily, I love chatting. I'll chat to anyone."